Those consuming fish and fish oil, a common supplement taken for its DHA content, may exceed the World Health Organization’s daily safety limit for dioxins and other industrial pollutants, such as PCBs. The pollutants in fish oil may increase inflammatory markers. Arachidonic acid and other pollutants found in fish may result in adverse effects on mood, which may lead to increased depression and possibly risk for suicide. Other industrial toxins in fish may include endocrine-disrupting pollutants and heavy metals such as mercury. During pregnancy, the health benefit from the DHA found in fish and fish oil, does not outweigh the possible mercury harm from eating most fish. Children’s fish oil supplements have been found to be contaminated. Long-chain omega-3 fatty acids are no longer found in sufficient quantities in chickens due to genetic manipulation. 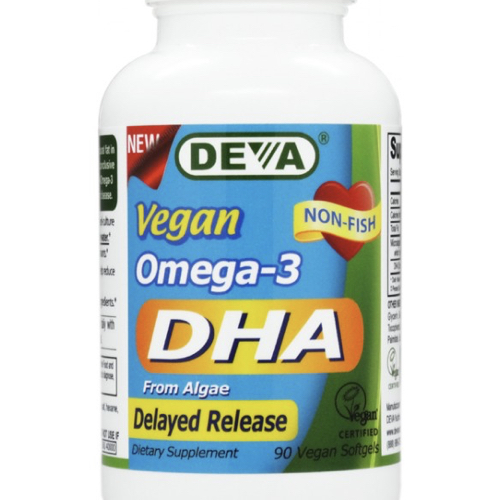 Omega-3 fatty acids are therefore best obtained from pollutant-free chicken-free sources, such as microalgae-based DHA.. Image Credit: DevaNutrition.com. This image has been modified. How many months does it take to clear 99% of the mercury and other industrial toxins from one’s body, and what role might our fat stores play in holding on to fat-soluble pollutants?